In deep fryer or heavy skillet, heat 2 to 3 inches oil to 375°F. In 2-quart saucepan, mix water, butter, 2 tablespoons sugar and the salt. Heat to boiling. Add flour and cornmeal; cook until mixture leaves sides of pan in smooth ball, stirring constantly. Remove from heat. Add 1 teaspoon cinnamon. Add eggs 1 at a time, beating vigorously by hand after each addition until mixture is smooth. Spoon mixture into decorating bag fitted with large star tip. Pipe 4-inch strips of dough directly into hot oil. Fry 2 to 3 minutes or until golden brown, turning several times. Remove carefully from oil with tongs. (Do not prick surface of churros.) Drain on paper towels. In pie pan or shallow dish, mix 1/4 cup sugar and 1/4 teaspoon cinnamon. Roll warm churros in sugar-cinnamon mixture. Serve warm. 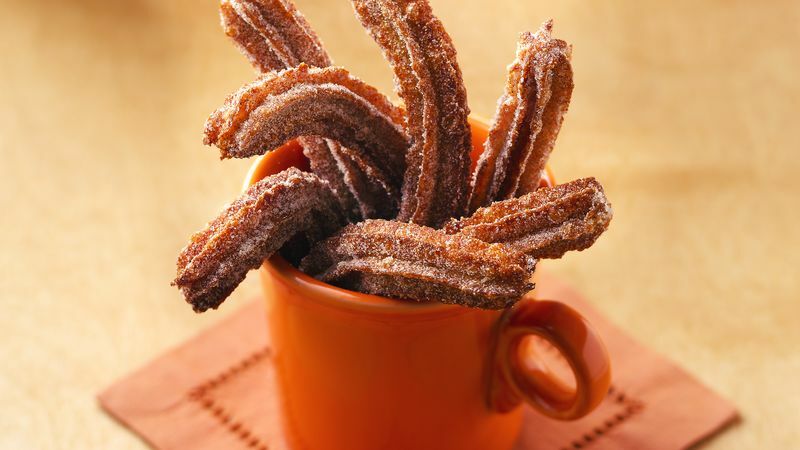 For a flavor variation, warm churros can be sprinkled with anise-flavored powdered sugar. In small bowl, slightly crush 1 teaspoon anise seed. Add 1/2 cup powdered sugar; mix well. Cover tightly; let stand at least 24 hours. Sift sugar to remove seeds before using.